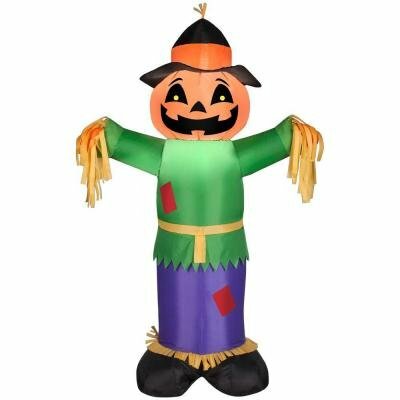 Welcome friends and family with the beautiful and colorful scarecrows in the lawn and home garden with a persona of warmth and homely charm. 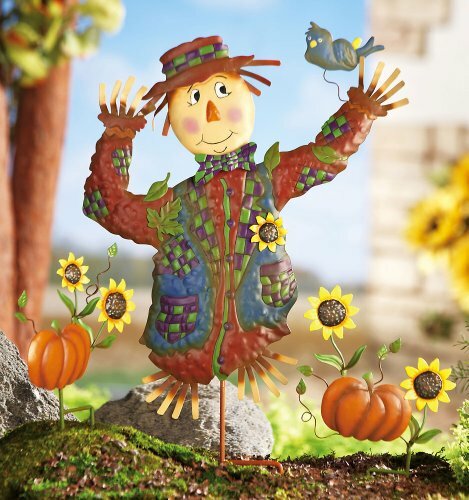 Hand painted scarecrows with green and bronze straws remind us of the colors of fall foliage. 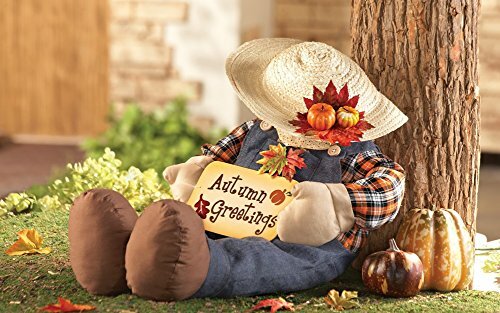 Painstakingly hand crafted scarecrows with metal to reflect the seasons of colors are capable of animating your patio in lively shades of red and orange. A bust of crimson and tangerine in your patio retains the fiery trait of Fall and Halloween with scarecrows waving their hands synchronized with the cool breeze. You can also transform your own pumpkin into a scarecrow in minutes. 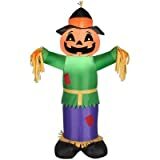 You can get the fake pieces of head, boot and hands from Amazon’s online store, push the pieces into a fresh or foam pumpkin to create a scarecrow decoration that can be enjoyed from Fall and Halloween to Thanksgiving. Attach a crow to make a masterpiece scarecrow pumpkin. Adorn it on your front porch or lawn along with hay and corn. This cute display can be enjoyed year after year. Wonderful item made from varying size of pumpkin with stuffed items of newspaper and plastic throw away items would become a stunning piece for autumn display. Bring the flavor of the pumpkin patch home with you. This 3-piece set will brighten your walkway or garden all autumn long. 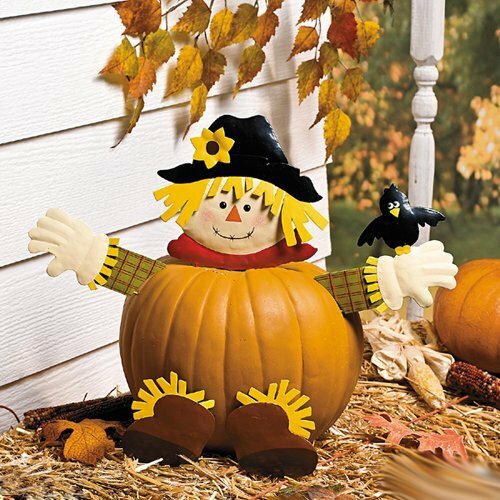 Welcome your guests with this adorably scarecrow garden gatekeeper. A scarecrow that comes with pre-stuffed head, hands and feet plus a fully-dressed body is easy to make, you can stuff it with discarded grocery bags or cotton. The most famous character of scarecrow comes from Frank Baum’s classic “The wonderful Wizard of Oz where the living scarecrow meets Dorothy who is one her way to the Emerald City. The scarecrow is on lookout for brains which he has learnt from an old crow. Since then, the scarecrow desiring to have brains just humans have otherwise he feels he will never equal man. The humble and shabby scarecrow helps Dorothy in her quest and ultimately gets what he desires. 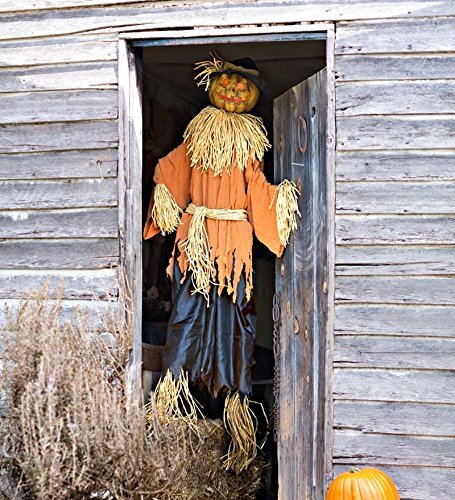 There are many other stories of scarecrows, and somehow we find them making into the holiday celebrations, fall events and Halloween. Another story of the famous scarecrow belongs to the weird character Crane. His obsession with fear leads to pursuing a career of psychiatrist. He loves to perform fear inducing workshops on his patients. He specializes in human psychology especially in the role of phobias, which he undertakes as a professor in Gotham University. However; his academic career ends when he fires a gun in a jam packed classroom injuring a student. No wonder, he ends up in the list of Batman’s most sought after enemies. Which is your favourite decoration for Fall? I like both, but will always prefer scarecrows. I like that harvest garden scarecrow. The one on the left reminds me of the scarecrow from the Wizard of Oz. I'm a sucker for jack o lanterns! Have you ever been scared of scarecrow? Hi Tolovaj, Quite an amusing thought - I might get scared of scarecrow on Halloween perhaps. 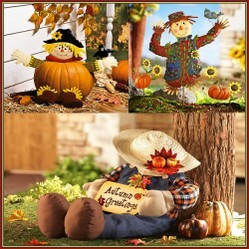 Hi KathleenDuffy - Scarecrows can look quite colorful and they match the colour of Fall. Hi AbbyFitz - Thanks for the comment. I love pictures - they say it all. Nope. Maybe because a scarecrow looks like me on bad hair day? some brilliant creations there! Really nice layout. Enjoyed this a lot!